The treadmill is the most commonly used cardiovascular training tool. But do we really know how to use it correctly? What are the benefits of the treadmill? In this guide we discover the benefits of running machines and the best treadmill workouts according to your physical level. We provide useful tips for even safer and more effective training and if you don't know how to choose from a wide range of treadmills, we offer you a simple guide to choosing the most suitable treadmill. Nothing can stand between you and a run anymore: if bad weather prevents you from running outdoors, you can always rely on a treadmill. There is no doubt: running and walking are fantastic physical exercises that allow you to burn a lot of calories and fat. It’s not unusual to find that when training on a treadmill you burn more calories than in road racing because sweating is greater and therefore also the calorie expenditure. In order to simulate the friction/resistance of an outdoor run, it is sufficient to set a gradient of 1-2%; of course the caloric effort increases in proportion to the speed and distance travelled, but these must be chosen according to their physical conditions. Running and walking focus on the legs, buttocks and calves. So what is the right exercise to tone them up more and also combat retention problems? Reduce the speed and increase the treadmill gradient so as to increase the working time (supporting the foot) on the belt and consequently the contraction of muscles and blood circulation. Cardiovascular training on a treadmill triggers blood circulation and improves cardiac efficiency: the result is that we will have more endurance and feel less tired so we are ready to face all our daily commitments. With this type of training, we will also keep the joints in activity, maintaining the elasticity necessary to prevent injuries or problems caused by aging. With the treadmill we can manage workloads and speed, creating personalized training paths. We can do this through the tool's predefined profiles or levels, working on the heart rate or with dedicated apps. All this allows us to train for various needs: from weight loss to marathon training. Increasing the slope allows you to train your cardiorespiratory efficiency and muscle endurance more. In order to perform a gradual work out, and not to fatigue too much, it is advisable to have a slope that reaches a maximum of 4% for the run and from 5 to 8 % for the walk. We also suggest alternating phases of slope and plain, every 3-4 minutes. The right workout if you need to start. On the treadmill, the body performs a movement similar to walking or running on the road. We have used the adjective similarly because however the effect of the activity on the treadmill is different compared to outdoor running: the shock absorbers, for example, reduce the impact on the joints with respect to asphalt or concrete, moreover concentration becomes more focused because the support plane is always flat and attention must not be paid to the pitfalls of the ground. For these reasons, the treadmill is recommended for those who need to start physical activity from scratch or resume moving after a long time. The ideal thing is to start with the walk and then gradually increase the intensity of the exercise. For a slow walk we set the speed within 5 km/h, if we want to make a fast walk instead we have to set between 5 and 6.5 km/h. While if we want to take part in a run , the speed will have to exceed 6.5 km/h. A run is recommended if you want to train intensely and slim down. Walking is a good choice if you prefer to tone up. Whatever the level, it is important to warm up and finish the workout with some stretching exercises. Ideally you will is to train three times a week for a minimum of 30 minutes, trying to be consistent for at least 3 months. Training to prepare for a marathon. The recommended training to prepare for a marathon is based on intensity control through heart rate monitoring. Using the sensors located on the equipment or heart rate monitor, you can set an exercise based on a constant heart rate, which must be at least 75% of the maximum heart rate. In subsequent sessions, once you are able to maintain the same training intensity for 45 minutes, you can gradually increase your heart rate (5 to 10 beats for each progression). Outdoor running and indoor running: can we use the same shoes? Basically yes, but if we think to use them only on the treadmill then it is better to opt for lighter and less cushioned shoes because the running surface of the belt is already cushioned and less hard than asphalt or concrete. On the other hand, shoes must be more structured and cushioned if they are also used outdoors. During the exercise we must always maintain an upright position, look forward and not turn around to avoid the risk of distraction and falling. It is very useful to use the mirror positioned in front of the belt to look at each other and possibly try to correct your mistakes during your run. Those who have a more professional approach to running can undergo an analysis of foot support in order to understand how to work better on their posture: often this service is offered free of charge in specialized running shops or alternatively you can visit a podiatrist. Depending on the temperature and humidity of the room in which you run, whether in the gym or at home, drinking is essential. Remember to take a bottle of water or other beverage: on the treadmills we will find comfortable places to store it. To gradually relax your muscles it is best to finish the exercise with 5 minutes of slow walking (recommended speed: 3 km/h) followed by 10 minutes of stretching on the ground or in a free space. Care must be taken to use the treadmill when articular and/or muscle problems have been diagnosed, especially with regard to the back, knees and ankles. In this case, it is preferable to use a crosstrainer that has a smoother movement and less impact on the knee and foot. Dedicated to those who want to train like athletes. 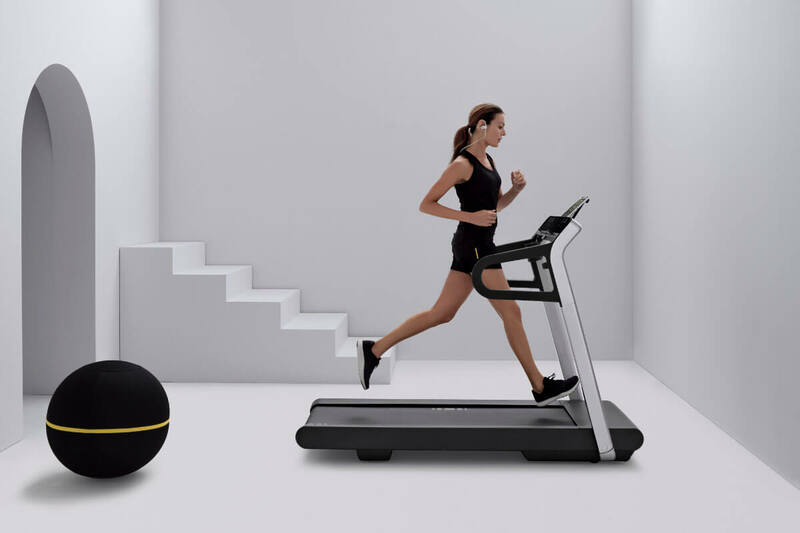 Technogym has designed the most innovative workouts on the market including high intensity interval training, speed resistance training and neuromuscular training, all in a unique training solution. Speed, Power, Agility and Stamina: SKILLRUN creates the new gold standard for performance running, meeting the needs of all runners, from sprinters to marathoners and triathletes. You can improve your running technique and performance with dedicated workouts and real-time feedback, keep your motivation high with immersive and entertaining options. Dedicated to those who love technology and music. Technogym has designed a dedicated app: MYRUN App. This application allows you to create personalized training programs based on your physical fitness and goals. You can download the app on your smartphone or tablet, place it on MYRUN support and start the scheduled workout. Thanks to the running rate index, you can also improve your running technique. Running on the treadmill is more fun with MYRUN, thanks to the running music function the tracks will be selected directly from the playlist contained in the device, but only those that best suit the running rhythm. Besides MYRUN is compatible with new Zwift Running Platform. Users will be able to train in different settings, with a vast selection of virtual scenarios, and customize routes based on various levels of difficulty for a digital experience packed with maps, routes, and competitive challenges. Dedicated to those who love functionality. 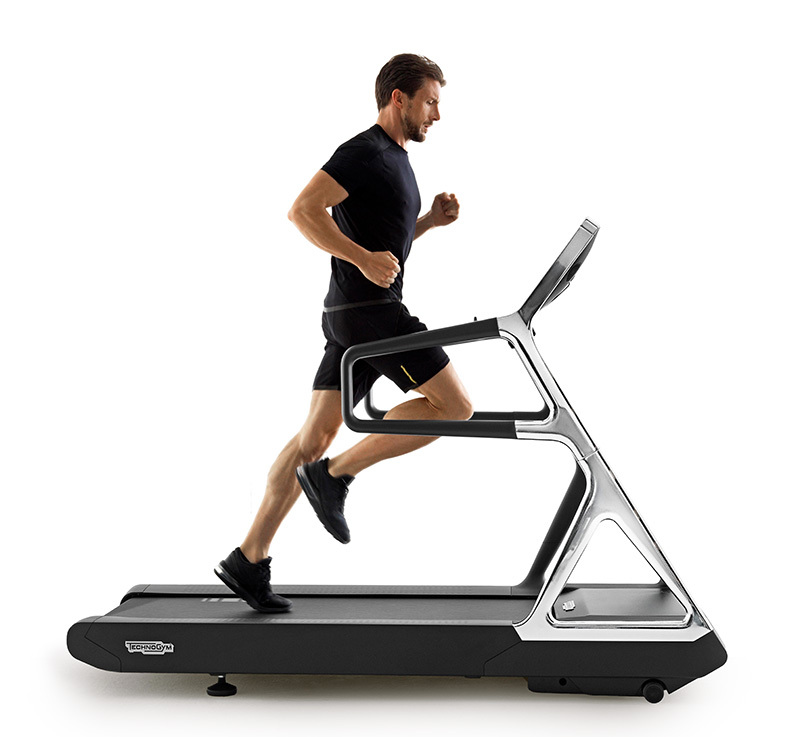 Jog Forma is a professional treadmill that combines performance and functionality in an exclusive solution. It allows you to enjoy simple and effective workouts thanks to the new user interface with QR code guidance and new hand sensors. The Constant Pulse Rate system follows your heart rate, automatically adjusting the speed, incline and resistance of the equipment to constantly provide you with a safe and effective workout. Dedicated to design lovers. 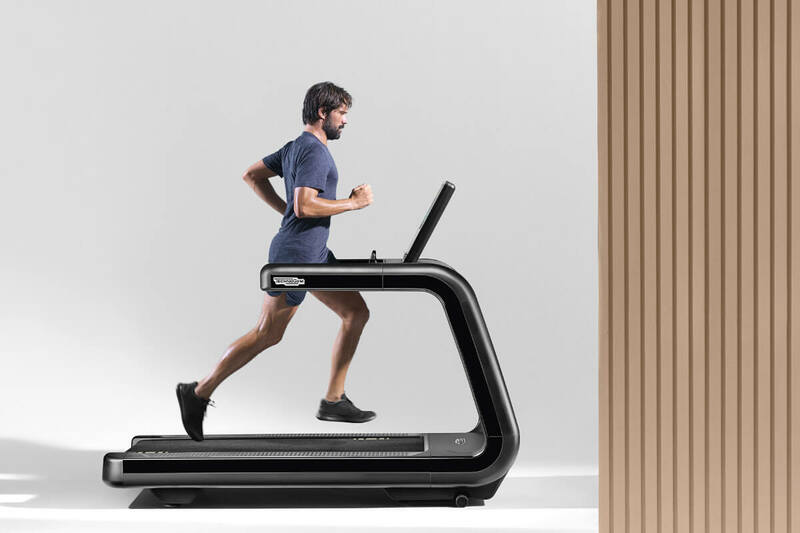 Run Personal is a synthesis of innovative materials and design, designed by Antonio Citterio and Toan Nguyen for professional cardio training and pure entertainment during a run. Polished aluminium, soft-touch plastic and glass come together to create a real design object with a unique and timeless design to create a high level wellness area at home. Run Personal was also built for professional sports performance: the engine, powerful and silent, adapts to any type of exercise, from simple walking to high intensity training. Its inclination reaches up to 15% to simulate uphill training. 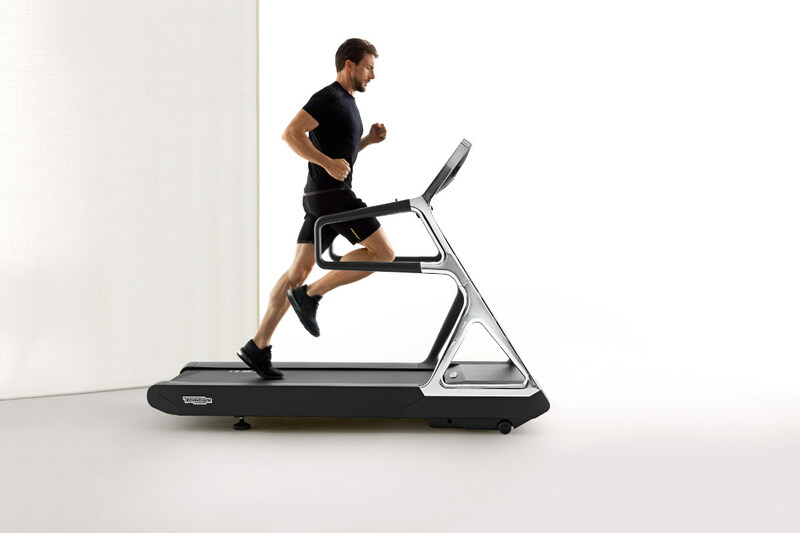 The treadmill has a large surface area for cushioned travel and joysticks that allow you to adjust speed and tilt without leaving the operating position.